You may well be wondering why this CD by Raymond Burley appears in the Gordon Giltrap Discography ? The answer is simple - all the tracks performed on this CD are composed by Gordon Giltrap. Raymond Burley, is a highly respected classical guitarist who is already known to many Giltrap fans as the other half of the duo 'Double Vision'. 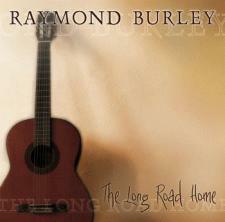 'The Long Road Home' is an album that no true Gordon Giltrap fan should be without. The tracks featured on this CD were written between 1980 and 2006 and are taken from various Giltrap albums. Although listening closely one can hear the influence of the composer's contemporaries, all the pieces have that unmistakable and easily recognisable Giltrap trademark but now heard with classical colouring. The Long Road Home is a highly impressive and enjoyable 55 minutes' worth of music associated more with the steel string guitar. Giltrap's compositions are not normally heard performed on the classical guitar but on the evidence of Burley's excellent arrangements, and wonderfully engaging and skilful performances, they are certainly none the worse for it and indeed provide a stimulating new dimension. Raymond Burley's intimate knowledge and expertise on the instrument has enabled him to bestow works which, up to now, seem to have been in the guardianship of the steel string guitarist. The acoustic guitar has many players with highly distinctive voices: their originality often stemming from being self-taught and forging musical careers unconventionally, paying dues in weird and wonderful places. Gordon Giltrap is one such musician whose unorthodox right hand technique has produced some wonderfully cascading tunes and a big sound. In this setting Raymond Burley, a player and arranger of considerable ability and sensitivity, has put together 55 minute's worth of Giltrap's pieces that date from recordings made between 1980 and 2006. Steve Marsh, in his liner notes, tells us that Burley has been able to arrange the music in standard tuning except for the odd dropped D, saving guitarists from re-tuning to some of Giltrap's myriad scordaturas. He also tells us the excellent news that the scores are available through Lathkill Music Publications. So, how to describe Gordon Giltrap's musical world to someone who has never heard his music. His penchant for renaissance era flourishes and solid harmonies lends itself well to the nylon-strung instrument. With Burley playing it's rather like Ralph Towner with a better classical technique, that's if you are familiar with Mr Towner, if not you should be. A lyrical folk influence is strong too with a leaning towards expressive melodies in a popular and accessible style. Burley's lovely, clean technique and warm sound, via his Christopher Dean guitar, is captured with typical excellence by the indomitable John Taylor. This is a recording that I recommend to listeners around the world to get a flavour of the almost mystical folk traditions that come from England and the British Isles, but are rarely conveyed with such conviction and intimacy as Raymond Burley has done here.